Cirque du Soleil is coming to the Germain Arena with a brand-new arena creation. 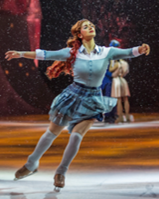 Cirque du Soleil’s CRYSTAL, explores the artistic limits of ice for the first time in the company’s 34-year history. This unique production pushes boundaries of performance by combining stunning skating and acrobatic feats that defy the imagination. CRYSTAL will perform in Estero for 6 performances only, Thursday, July 12 through Sunday, July 15, 2018. Cirque du Soleil wishes to thank Forsythe Technology ; official sponsor of Cirque du Soleil.